conky transparent window on Fedora with Gnome. On Fedora with Gnome-shell 3, its been long time that I was not able to get transparent window. So, finally I thought to spend some time to try to fix that. Finally got that fixed with all the configurations below in the conkyrc. Here the default color is set to LightSkyBlue but feel free to change that. Author Amit AgarwalPosted on July 22, 2013 July 7, 2013 Categories Fedora, GnomeTags Conky, Fedora, Gnome, gnome shell, Graphic Subsystems, Operating Systems, ubuntu, X11Leave a comment on conky transparent window on Fedora with Gnome. Check out all the colors on you X window system. If you ever wondered what combination of some colors would look like but did not really feel like setting them in your xterm just to check them out. 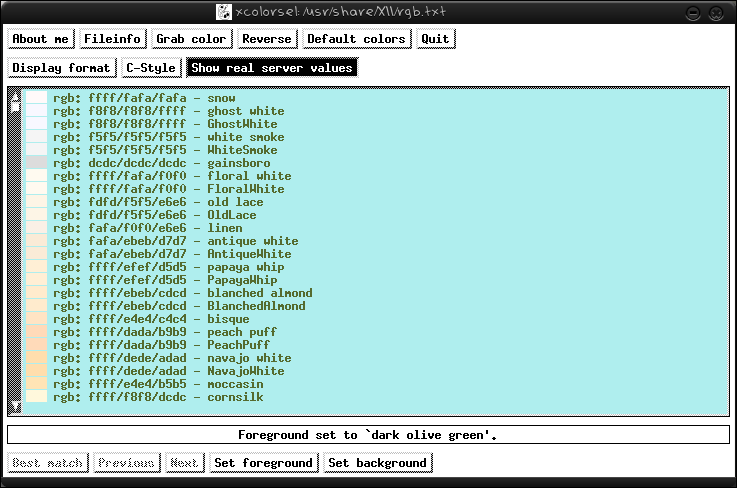 Or if you wanted to know about all the colors on you X window system then you can install this utility called xcolorsel. You will need to setup the rpm-shere repo for this. Using this tool is very intuitive, just select the color and then press set as foreground/background to check how the color combination would look. Author Amit AgarwalPosted on February 24, 2012 February 5, 2012 Categories FedoraTags buzz.com, First Stable Release, Graphic Subsystems, Linux, Operating system, Operating Systems, Solaris, Terminal emulator, Wayland, Windows Phone, X Window System, X11, xtermLeave a comment on Check out all the colors on you X window system.